Outcome of prompt actions against black money always raised success fruits for government. As per an official report presented recently, some undisclosed assets totalling about Rs 6000 crores have been detected in the scrutiny process enacted under the Foreign Black Money Law of government, brought up in 2015. As defined in a written statement by Minister of State for Finance Shiv Pratap Shukla to Rajya Sabha, ‘that a one-time compliance opportunity for a limited time period was given to all those persons who are holding foreign assets to disclose such holdings and protect themselves from tax impositions and thereto was not disclosed for the purpose of Income-tax. 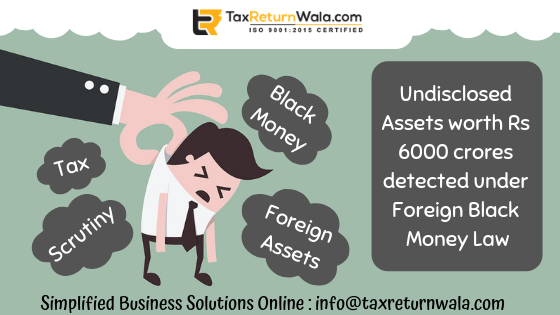 As an outcome of many deliberate actions taken by the tax department under the Black Money and Imposition of tax Act 2015 as on 31st Oct 2018, some undisclosed foreign assets and income valued over Rs 6000 crore were detected’. Also, as on October 31, 2018, about 34 prosecution complaints were filed under the Foreign Black Money Law. ‘Department is seeking for suitable actions to be taken against these persons holding foreign assets and black money. Such actions might include inquiries, levy of taxes, assessment of income & sources, and filling of prosecution complaints in the criminal courts wherever applicable’, Shukla added in his statement. As per government records, in the compliance window closed on 30th September 2015 ,about 648 declarations involving foreign undisclosed assets worth over Rs 4100 crore were made and an amount of over Rs 2,470 crore was collected by way of tax and penalty from such cases. Also Read : Government allows premature withdrawal from New Pension Scheme Fund.